Only place I find these covers. When friends comment I give them a set. Have given them to lots of people.Must have spares. Don't want to run out! colors. Hate to be without one!! the person who invented this article is a genious. My husband wishes he was the inventor! A genius! Once you have used one of these seat covers you will never go back to a bare cold seat. The seat and lid cover are a great combo. The price is great and the shipping was fast. This item washes up great and will last for many washes. I bought two so I could have a clean one while washing the dirty one. I love these seats. Have gotten comments from family saying how soft they are. I combine mine with a padded seat and it's heaven for your booty. I even leave mine on year round. I am the only person in my household to use this, so don't have a sanitary problem. Others can use the uncovered second bathroom toilet. I won't ever be without one, since getting one years ago. Instructions clearly state to remove plastic ring BEFORE washing and AIR DRY, not use dryer. Stays in great shape when treated properly. LOVE, LOVE, LOVE!! USED FOR ABOUT 10 YEARS AND WOULD NOT (NOT) BE WITHOUT THEM!! IN COLD CLIMATE, THE ARE FABULOUS, BUT EVEN IN SUMMER, THEY ARE WONDERFUL. AND THEY WASH FINE; EVEN WITH (OR WITHOUT)THE PLASTIC RIM ON THEM!!! FIRST USE, A *BIT* HARD TO GET ON, BUT EASY AFTER THAT! AFTER MANY WASHINGS AND USES, FINALLY THEY GET WORN. THEN I GET PANICY AND ORDER MORE/MORE! ONLY, ONLY PROBLEM (IN 10 YEARS)IS THEY'RE GETTING HARDER ASND HARDER TO FIND! THANK YOU MILES KIMBALL FOR CARRYING THEM!!!!! NOT GIVEN OR PAID **ANYTHING** FOR WRITING THIS!!! I SIMPLY ADORE THEM!!! It really helped my Mom not be cold when she got weak. My daughter-in-law liked it when she tried it. Got it for a friend who has cancer. I use these in every bathrooom, you have to have one! I may be a budget shopper but I will always have a warm seat in my bathroom! These are the best for the winter months. They do stretch out after a few washings, but I keep an extra on hand just in case! I have bought all colors for myself, & many for gifts. Everyone loves them. I just wish I didn't have to work to stretch them over my elongated seat & lid. I'd be miserable without them. I like them so much I keep an extra for the days one is is the laundry. I've been asked where I got them and told. It's very warm and comfy. These are the best things you could ever use in your bathroom, you never worry about the toliet seat being cold , or the thought of the hard surface it has I truly love this !! 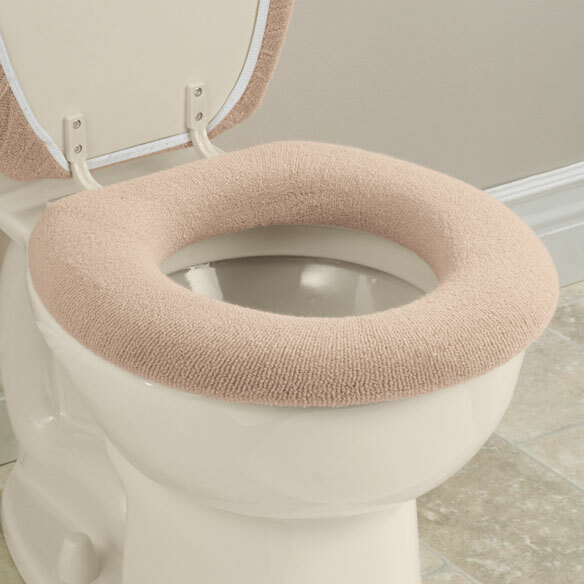 I purchased the toilet seat cover because my bathroom is cold, especially in the winter. Now the warmest thing in the room is this cover. Love It. I just moved into a new apt & wanted this to cover the toilet seat. I ordered it, it arrived as it said it would & I love it.....Sooooo comfy & keeps ya warm! Also goes great with my beach decor. I bought my first seat cover about 1 year ago and now im getting two more, for extras and for when one is in the wash. They wash and dry very nicely and are so nice and warm to set on. I think these are a must have. This fit very easily on the commode. While the weather was cold, the cover made it very "comfortable" when sitting. We Wouldn't Live Without Them! My husband and I have been buying and using these for over 15 years! They stopped selling them in stores and we were upset to hear that. Then we found them in your cataloge. They are comfortable, warm to sit on. Wash nicely and don't stain. A wonderful product we don't want to live without. Sometimes during washing the plastic band comes out but it threads back in easlily. I had used these before, but for longest time lost a sorce to find anymore. The greatest day when I finally found them again, I actually stocked up on them. They coordinate well with all your color schemes. Washes well, looks good, nice and warm. I've reordered these seat covers many times. Inexpensive enough to replace as needed. Washes in wash machine for easy cleanups. Lasts a long time. Wish they came in a burgundy color! The main reason I like this product is that it is great in the winter-no cold seat!!! I hate cold toilet seats! Since no one has invented a warm toilet seat, This is the next best thing. I am up several times during the night, and it's nice to sit on a potty seat that isn't frigid cold from the air conditioning or from low temps in the winter. No rude wake up when sitting down. Buy several so you can always keep them clean! I hang mine to dry so they last longer. I have a set from 3 years ago that are as good as new! I wwould not be without this product, specially in the winter. I have several so I can wash one and not be without till it dries. The cover provides comfort n warmth, especially in winter time. I've given as gifts and people love them. The colors are nice also! I'm so glad I found these! My toilet seat is freezing in the winter-it's really the only reason I don't like having the heat turned down. This cover is wonderful-it's soft and comfortable and I'll never be without one again! My One regret about this item is that I only discovered it last year. My bathroom is Freezing during the fall and winter and I used to dread going in there. These covers are Amazing! Do your 'cheeks' a favor and try one, you'll be thrilled you did! warm seat in the middle of the night. Never having to sit on a cold toilet seat in the middle of the night, or any other time. Well made, very soft. Easy to install. The knit fabric will snag on things, so I suggest washing in a delicates laundry bag. seat anymore. Best idea out there! Been using these for years. Absolutely love it! Its the best thing I have bought! Now I look forward to going! So Inviting! Removes all the dread of sitting down during cold temperatures. 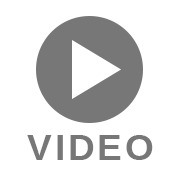 Install easily to remove and put back on when cleaning. I invite all my lady visitors to experience this awesome invention! Wouldn't be without it now. I keep an extra to use when the first is in need of a wash. Give as gifts to family and friends. I added elastic to 6 inches on sides to old ones that lost the 'spring'. Good as new. Feels nice. Fits well. Looks good. So nice on a chilly morning. Stays in place very well, launders easily, appreciate the comfort. I knew this cover was a hit when my husband asked me quietly,"Could you get another one of these for the downstairs bathroom.? They're very nice to sit on. This from my 'nothing is too cold for me man. Touchdown! My husband and I love these covers. They are nice soft and warm. The seat covers keep me warm when I sit on them. I enjoy the color I have purchased but I wish they came in other colors like gold and brown. They really make my bathroom look attractive. All in all I am happy with my purchase and look forward to new colors coming in soon. 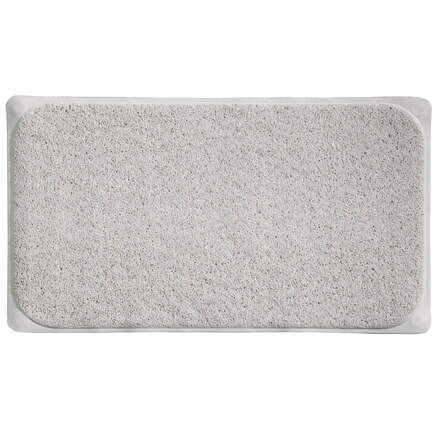 I would recommed all to purchase, they keep you warm and make your bathroom experience wonderful on those cold days. We love these seat covers. We use them in our RV and at home. Great in the winter. They're padded so you don't sit on a hard seat and also don't sit on a cold seat in the wintertime. LOVED THE LAST ONE I ORDERED . hopefully this will keep me from sticking to the toilet seat! I am buying these for my parents. They just love them. this is the second order for them. Thank you. Hope to keep the seat in my camper warmer on cool nights. 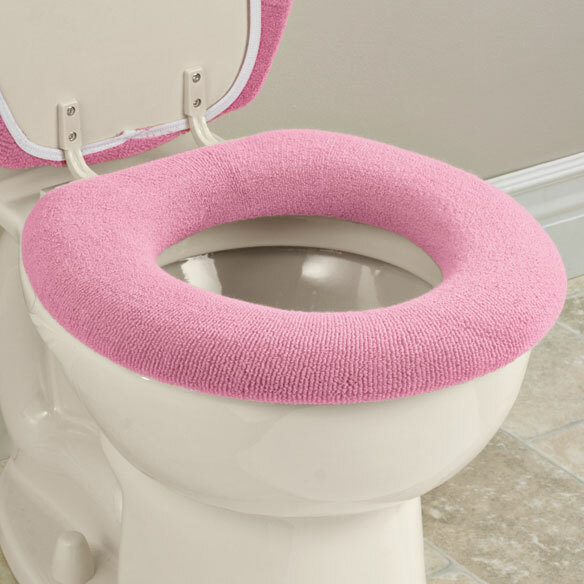 We love the comfort of the soft seat toilet covers. 'Have one. My husband likes it. The fit is imperfect, but, it helps. I like it 's comfortable feel. We really love this. They keep are toilet looking nice. I have ordered them before and find them very practical and comfortable to use as well as being attractive. I have had these for years and love having a warm seat in the winter and summer in the air conditioned home. It was inexpensive and I always order from Miles Kimball because I get my items fast. I love these, ordered them before but they have a pretty short life. They tend to stretch out after 4-5 washings by hand. Still love 'em especially at our elevation of 8500+. Best solution to cold bathroom fixtures; economical, too. these are very nice keep your bottom warm in the cold months. I have had these before.I like them .They are so comfortable.Easy to clean.I buy two so when I wash one,I have another one to use. I have used these covers for years-changing colors. Love the covers. Bought it for a friend as she had been looking for one and you had this in your catalog. It will help keep us warm in the basement..and love the color!! It is warm and comfortable, launders easily. I now have 3 in different colors. Love it. I will comment after I receive product. I thought it was both. Wasn't so deleted it. We do not like sitting on cold toilet seat. We are in our 80's. Because I like the covers & it came in ivory color. I've used this for years. It's nice to sit on the seat without freezing! Will this cover fit on an elongated toilet seat? BEST ANSWER: Thank you for your question. Yes, this item will fit on an elongated seat. We hope this information will be of help to you. It won't fit on my toliet seat sized 17L by 14W is there one that will????? How much padding does the seat cover have? BEST ANSWER: There is no actual padding--the fabric is like a thin towel. the inside is smooth and the outside is like terrycloth. 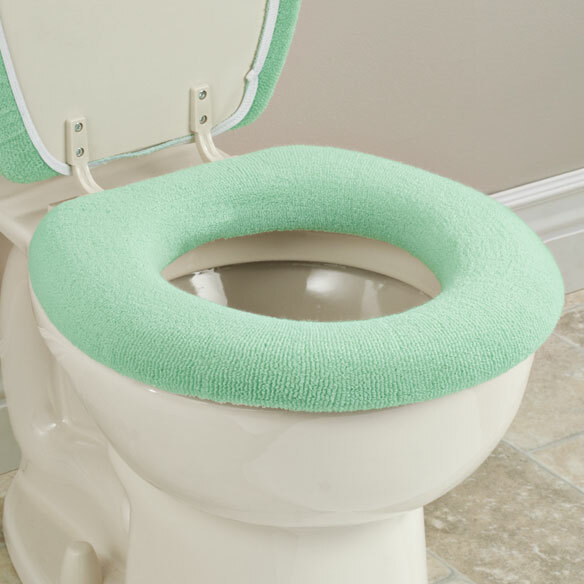 Although not padded, it does make the toilet seat warm and much more comfortable. It has more padding than a thin tea towel but less than a fluffy bathtowel. It has a Terry cloth texture. Difficult question to answer with words. A moderate amount, enough to make it soft and comfortable. I bought two or three pink ones. I just wish they came in lavender and aqua colors. No padding, but a soft material, minimal cushion and no cold ring to sit on. My wife said it was the best ever bathroom accessory. The cover does not have padding. it is terry cloth. 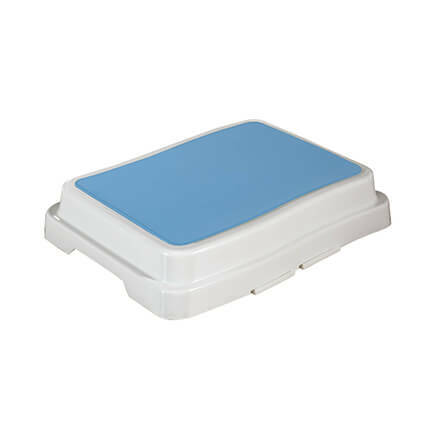 Very good for winter with cold toilet seat. Great accessory! not really padded, it's terry cloth. but stays put and is warm on my normally chilly seat. love it for winter! There is no padding. It is just a cloth cover so your not sitting on the cold toilet seat. There is no padding, but the seat cover keeps the seat from being cold. The seat cover is soft and comfortable, but does not have much padding. It is made out of stretch terry cloth. is this a set for lid cover and seat cover? BEST ANSWER: no not this one....it is only the seat.....there is another one and the demo is blue...there are the seat and cover together et it is 9.99. It comes both ways. You can order the seat cover only, or both the seat cover and lid cover. I have both, and love them all. No it is not a set - just the seat, not the lid. It is SO nice to not sit on an ice cold seat in the middle of the night. No, it is only for the seat, not the lid. But I would still recommend purchasing it because it makes a huge difference. Just the seat cover. These are great at our house. Hope this helps. No, this does not have the lid cover, it is only the seat cover. Just the seat and it feel wonderful on a cold night. No, we just bought it for the rim, no the lid. Just for the seat - no lid cover. How do you put the toilet seat cover on? BEST ANSWER: Hopefully this will not be too wordy. Carefully put the portion of the toilet seat cover that has the plastic ring threaded into it, inside the toilet seat opening. Don't let go of it! 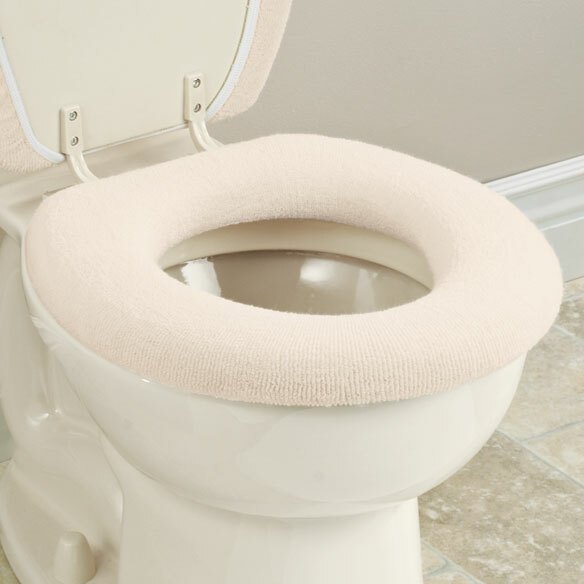 Start stretching the seat cover over the Front edge of the toilet seat. Ensure the correct side of the seat cover is facing up. Starting at the front of the toilet seat stretch the cover over the toilet seat and under the Outside edge of the toilet seat. I use my knees to hold the front of the cover stable on the front edge of the seat, and use both hands to stretch the cover along both sides at the same time. It is tricky until you get the hang of it. But once you get it on you will Love It! lift the seat slightly and place the cover underneath with back side of fabric against the bottom of the seat. With one hand reach through the seat and pull the soft edge up through the hole. The hard ring will stay underneath. Stretch the soft edge up and over to the underside all around. I start at the front and then lean my knees against the seat to hold it in place while stretching around the rest of the seat. Hope this helps. Lift the seat up. Hold the cover in your hands wire end down then pull the un-wired in through the hole in the toilet seat. Let the seat down easy and stretch the un-wired end over the toilet seat. If the wire end is showing through the hole, just pull it under a little until it can't be seen. Put the cover inside the seat inside out. Then pull the cover out & over. I start with the front & hold it with my knee to be able to cover the back of the seat. 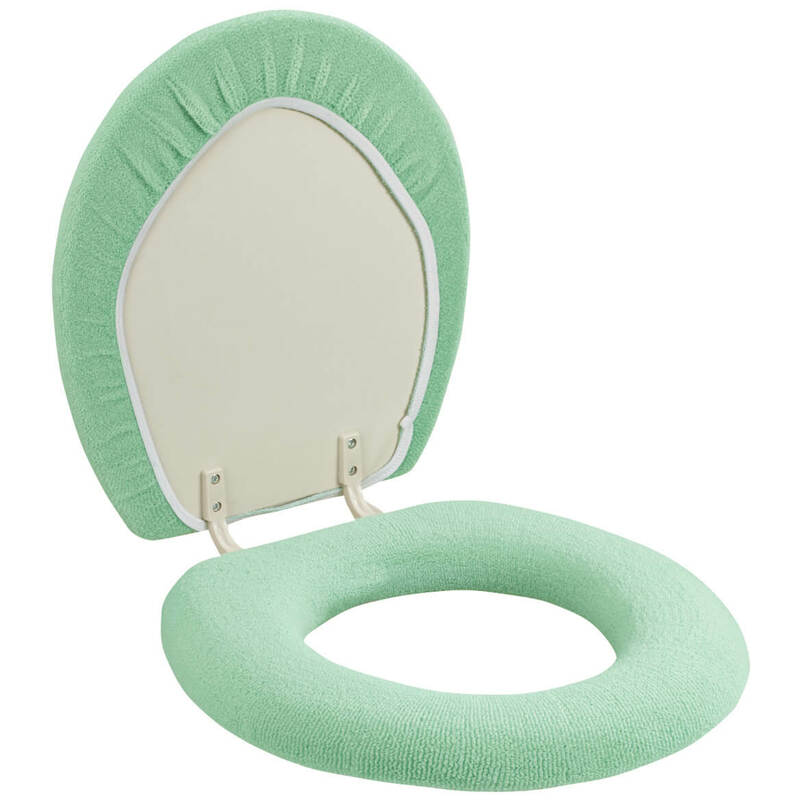 the round seat cover does not fit a oval toilet seat. Item Number Tiolet seat cover? BEST ANSWER: Hi Loretta - yes, this is a toilet seat cover. Have you ever gotten a shock from a COLD toilet seat in the middle of the night or first thing in the morning? That's the beauty of having these seat covers. No more uncomfortably cold seats. And, you can throw them in the washing machine without shrinkage. We'll never go back to bare toilet seats again! Great, I buy them all the time! I don't like a cold toilet seat! BEST ANSWER: Thank you for your question. 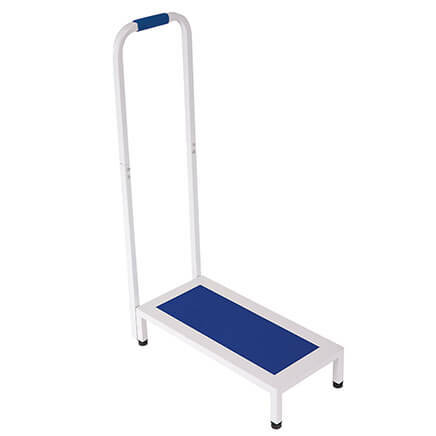 It fits toilet seats up to 17 ½” long x 14 ½” wide. We hope this information will be of help to you. I need the item number of your toilet seat covers? 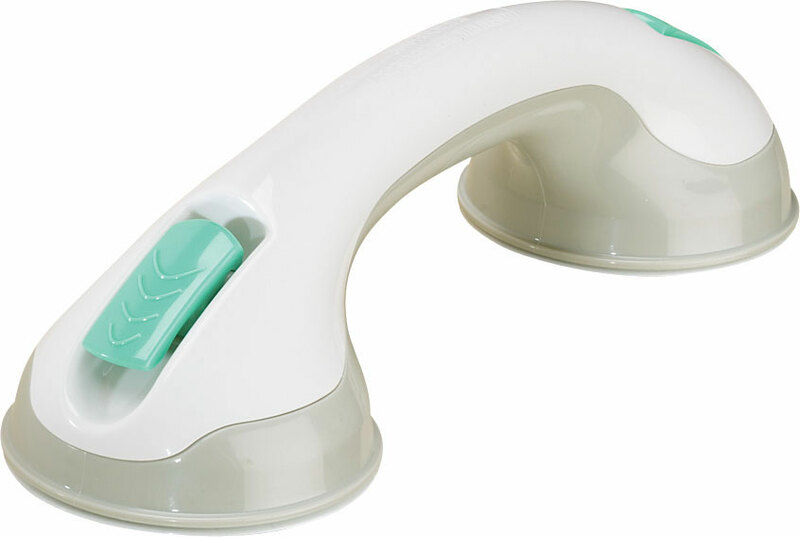 Turn your shower spout into a detachable hand-held shower sprayer. 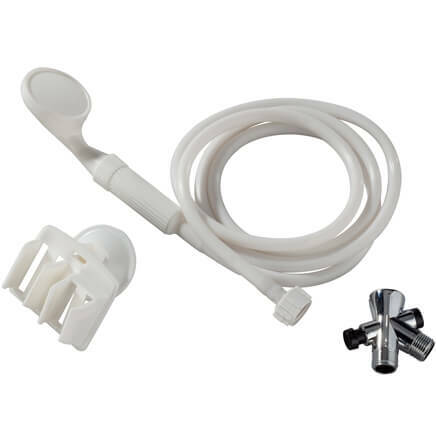 Great for bathing children and pets, this detachable shower head includes suction wall bracket and hardware. Handheld shower head is 6' long. Plastic.